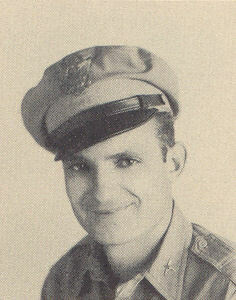 1st Lt. George B. Price, son of Dr. and Mrs. W. B. Price, attended Grandfield High School, Denton, Texas, and Washington Univ. ; husband of the former Olive Hight. Entered Air Corps in Jan., 1942, trained in Santa Ana, Cal., Roswell, N. M., San Marcus and El Paso, Texas; served in England, Germany, Austria and France; was discharged. Awarded Air Medal with Oak Leaf Cluster, ETO Ribbon with three Battle Stars, Good Conduct Medal, Pres. Unit Citation.